Four masters fought it out in today’s top quad. NM Nicolas Checa won with an impressive 3/3, the only perfect score of the day! Yoon-Young Kim continued his strong run as of late finishing with 2.5/3 in quad two. 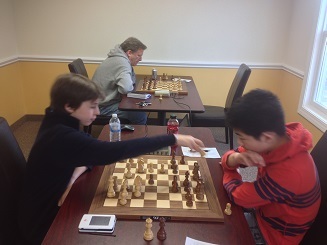 Scott Buono won his tournament at the CCFC also with a score of 2.5/3 in quad three. Kenneth Young was the heavy rating favorite in quad four, and despite a round two slip against Deyuan Li, he still managed to finish strong to win the section.